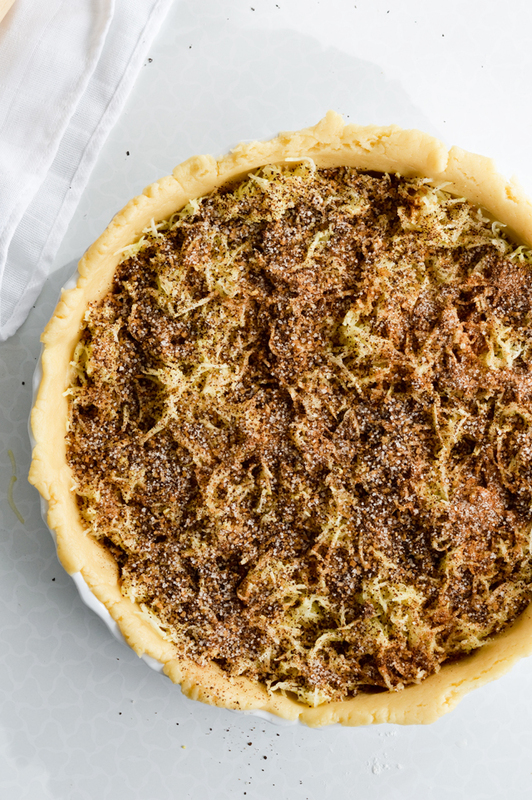 Poppy seed sweet zucchini pie isn’t your usual pie, but it’s damn good. I’ll be honest. I wasn’t sure if sharing this recipe would be a good idea. 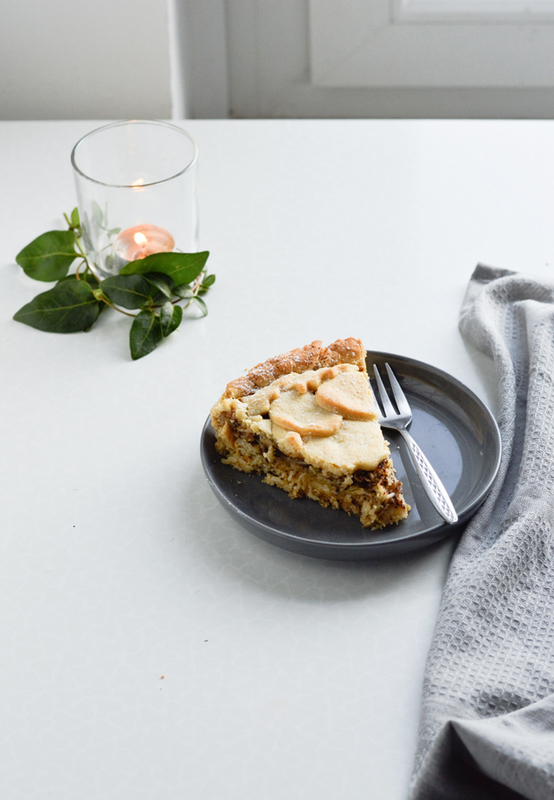 The pie itself is great and definitely worthy of sharing, but since I’m using zucchini and we’re in the last week of October I feel like I’m really pushing it ingredient-wise. I don’t want to share something you can’t recreate in your own kitchen and I try to stick to seasonal ingredients because of this. But fingers crossed you live in an area where you can still get some zucchini, after all this is still October and we’re not buried in snow just yet. I know a lot of food gets imported and we can buy produce out of season, but I try to avoid that because the difference in taste is noticeable (and the price higher). 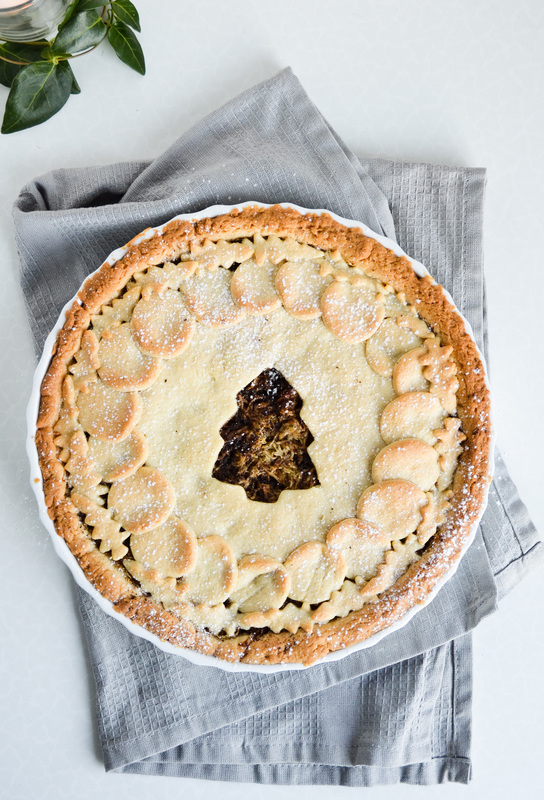 And really, coming up with an excuse not to share a pie recipe is damn hard. 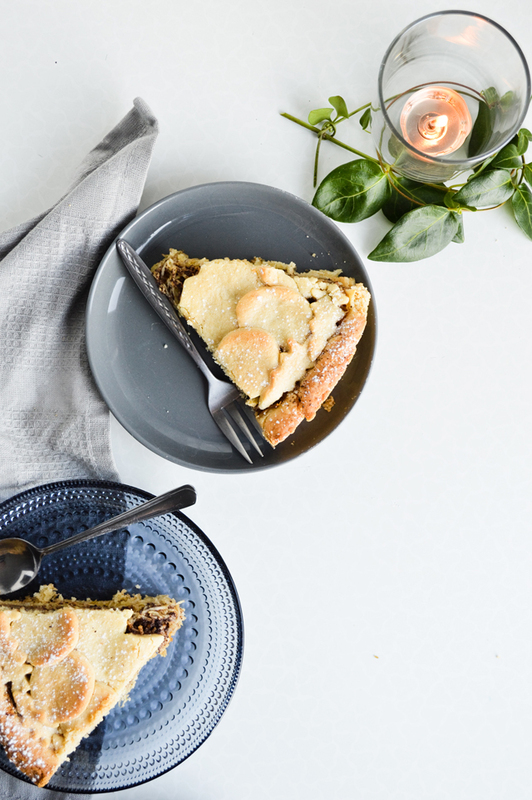 Who doesn’t love pie? I know I do, whatever the season or type of pie. If you were offering a piece, I’d be the one to raise a hand and wave without hesitation. 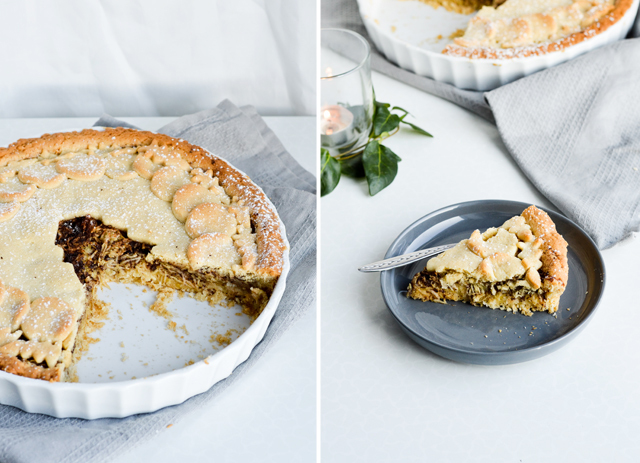 While a poppy seed sweet zucchini pie isn’t the most ordinary thing when you first hear about it, it’s really a very normal, homey pie. Exactly what any pie should be. I first had zucchini in a dessert about 12 years ago, when one of my uncles grew an absurd amount of zucchini in his garden. A crop so big he needed new ways of using them all. My uncle is a crafty guy. He can make wreaths out of dried oranges, the most beautiful bouquets and the best strudel. 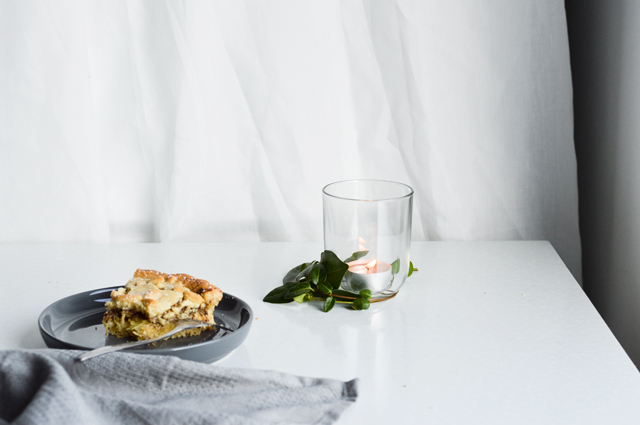 And that is what he kept baking that summer, a wonderful sweet zucchini strudel. Luckily my extended family is pretty big, so eating all of it wasn’t a problem at all. Honestly, I love a good strudel as much as I love a good pie, but instead of a zucchini strudel I wanted a sweet zucchini pie this time. 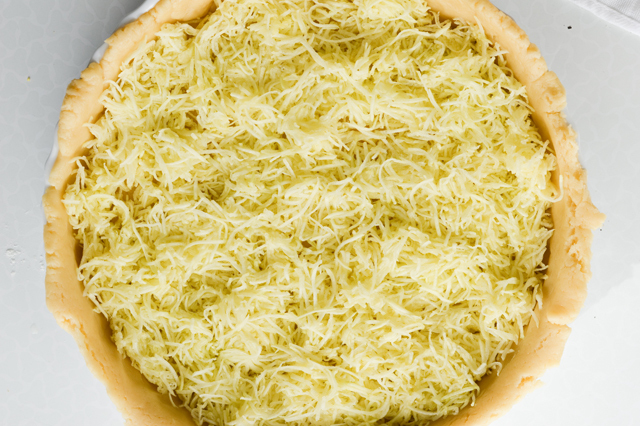 It’s very similar to my classic apple pie, but instead of grated apples it is made with finely grated zucchini. These are topped with a mixture of sugar and ground poppy seeds, which add a new dimension to zucchini flavor. 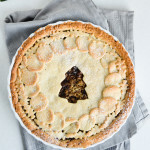 The baked pie smells wonderful, the base is buttery and crumbly while the filling is moist and quite mild. It’s hard to guess you’re actually eating zucchini and not some incredible Fall fruit. I like to use just zucchini, however a mixture of zucchini and apples is just as wonderful. Or instead of that, a dollop or two of apple sauce fit in nicely too. And then a dollop or two of whipped cream or ice-cream on each slice as you serve this beauty, if you want a really decadent dessert. 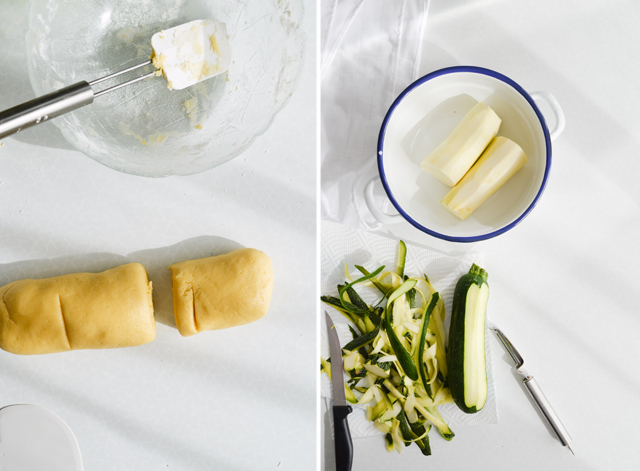 Recipe makes one 9-inch (23-cm) sweet zucchini pie, that can be cut into 8 pieces. In a bowl combine flour, baking powder, salt and sugar. Set aside. In a medium bowl beat eggs and butter until creamy. Add vanilla extract and sour cream and whisk until incorporated. Add the flour mixture in 3-4 additions, stirring well between each one. The dough needs to be smooth and soft. Roll dough in a log and cut into 2 parts, one being the size of 2/3 and the other 1/3 of the dough. Flatten each part in a disk, wrap in plastic wrap and chill in the fridge for 50-60 minutes. Cut all ends off the zucchini and peel all the zucchini. Finely grate the zucchini either with a box grater or a food processor. Transfer to a sieve placed over a large bowl and let stand for 30 minutes or more. This way the zucchini will release some of the liquid, making sure your pie isn’t wet in the end. Set the oven to 180°C (356°F). 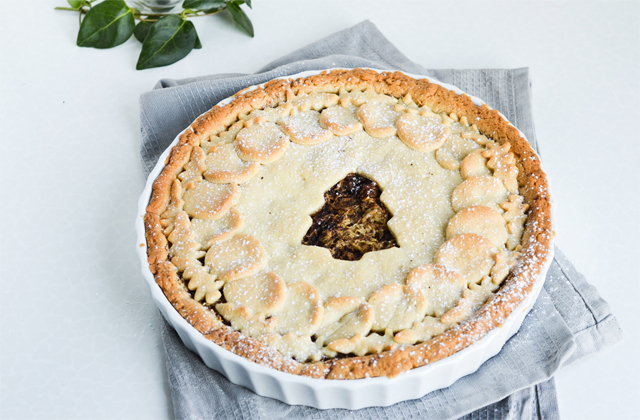 Butter a round 9-inch (23-cm) pie or tart baking dish. Set aside. In a small bowl combine the sugars, ground poppy seeds and cinnamon. Set aside. Transfer the dough to the baking dish and push it down the bottom and up the sides. If it tears, simply patch it up with some extra dough. Spread over half of the zucchini, sprinkle with lemon zest and juice. Top with 2 tablespoons of apple sauce (if using) and sprinkle with half of the sugar mixture. Top with the remaining grated zucchini and sugar mixture. Roll out the smaller portion of the dough. If you want, cut out a tree shape or any other decoration with a cookie cutter. Cover the pie and pinch this layer of dough together with the bottom part of the pie. Bake pie for 40-45 minutes, until golden brown. Remove from the oven and let sit for at least 10-15 minutes. Sprinkle with sugar before serving. 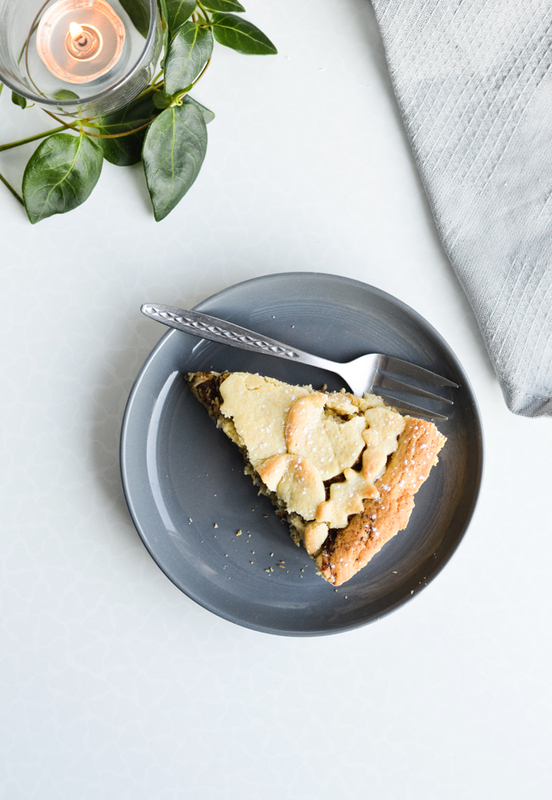 If you want to make a zucchini-apple pie, only use half of the zucchini and substitute the other half with grated apples. 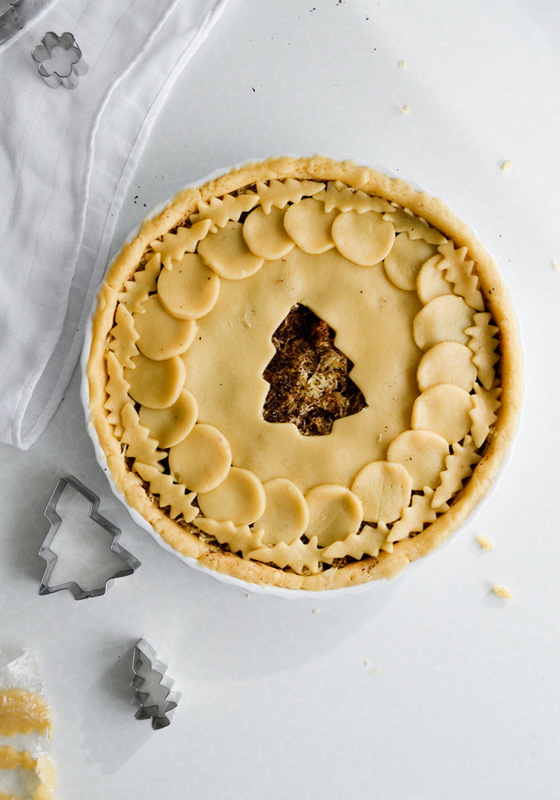 This pie is moist and even better after it completely cools or the next day. Keep it covered and stored in the fridge for up to 3 days.